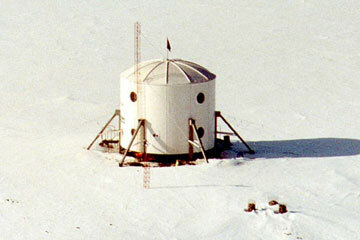 The Flashline Mars Arctic Research Station simulates Mars in the Canadian Arctic. Kim Binsted says she sends an application to NASA every two years to go on a Mars mission. Kim Binsted will post messages throughout the mission simulating Mars in the Canadian Arctic on her blog, www.mars-ho.blogspot.com. Formal reports and a crew blog will be on the mission Web site, www.fmars2007.org. "I don't think they're going to get their act together fast enough for me," the University of Hawaii at Manoa computer science professor said in an interview, noting she is about the right age now, at 36, for a mission. So she is doing the next best thing: joining six other crew members from around the world on a unique four-month mission simulating a Mars voyage in the high Canadian Arctic. She will leave Wednesday for the Flashline Mars Arctic Research Station on Devon Island, 900 miles from the North Pole. Binsted specializes in artificial intelligence and teaches design for mobile devices. She used to have a startup company that did software for telephones, she said. She is co-investigator with the UH's NASA Astrobiology Institute and chief scientist for the simulated Mars exploration. Her job will be to coordinate collaboration between the crew and an "Earth-based" Science Advisory group. She will lead some projects and will be a guinea pig for experiments, along with her colleagues. When she heard about the expedition in August, Binsted said, "I thought it sounded like a great adventure. I applied and was accepted." The Mars Society, a private international grass-roots organization, is sponsoring the mission to investigate exploration techniques that could be used on Mars. The crew includes scientists and engineers meeting qualifications to be "physically fit, adventurous and committed to Mars exploration, with a vision for the future," Binsted said. She is a Canadian with dual citizenship but said she has never been to the Canadian Arctic. It will be the longest, most isolated human Mars simulation mission, testing the crew under arduous conditions astronauts could face someday on a Mars mission, according to the Mars Society. "It's going to be very tricky, being in close quarters a long time," Binsted said. However, she said the crew got along well together during a two-week training mission in February at the Mars Society's Mars Desert Research Station in Utah. The scientists tried out the spacesuits they will have to wear every time they go outside of the Arctic station. Binsted said the Arctic station "is kind of neat. It looks like two tuna cans backed up to each other." It is basically a two-story cylinder, with lab space on the lower floor and living space above, she said. It has a total of 1,000 square feet, she said. With 500 feet for seven people for four months, she computed, "It will be a little crowded." The spacesuits, required outside, also "cut you off," she said. "Your field of vision is restricted. You are covered from top to toe. ... It doesn't feel like being outside properly." Much of the training had to do with safety, she said, "learning to use firearms in case we have close encounters with polar bears." The crew had first-aid training because of their isolation, she said. One crew member is an emergency medical technician, and two can do telemedicine but there is no doctor, she said. It would take about two hours to get a doctor flown in from the Resolute weather station under the best conditions, she said. Physical and biological studies will be done on the Arctic environment and on the crew, looking at their morale and general psychological well-being over the four months.